Where to get some fancy drinks when you have something to celebrate. You know how it feels like some establishments were built precisely for you? That’s how we feel about Death & Co. Any place that makes room on their menu to quote Hunter S. Thompson - “I hate to advocate drugs, alcohol, violence, or insanity, but they’ve always worked for me.” - is on our wavelength. It’s no secret that we like to booze. When it comes to fancy cocktails, Death & Co is one of our favorites. The drink list is ridiculous...it’s nearly impossible to settle on something because each beverage is intriguing and awesome. Some of our favorites are the Cure For Pain (rye whiskey, vermouth, bourbon, and more goodness) and the seriously tasty Rita Hayworth (pineapple and sage-infused siembra tequila, lime juice, and acacia honey syrup). Damn is she fine. It wasn’t until recently that we figured out D&C was more than just a place to grab a libation or two. You can actually have an excellent meal as well. Think of it as a tapas joint that resembles a wedding cocktail hour: American classics that go quite well with a drink shaken or stirred. The kitchen paces itself well, so dishes come out one at a time, and they give you a chance to enjoy your drink as well as the food. After a long day, a Robert Johnson Swizzle (single barrel bourbon, lime juice, 10yr port, vanilla syrup and more) with a side of truffle mac n cheese is exactly what the doctor ordered. Some of the best tuna tartare we’ve had in recent memory and a steal at twelve bucks - it’s a nice amount of food. The tuna has a really nice spicy kick, and it’s served with homemade kettle corn chips that are stupid good. Get this. When we sent out a tweet from Death & Co, we got like 6 replies all saying some version of “holy crap the mac and cheese spoons are off the chain!” The people are never wrong. Indeed, this stuff is chronic. Served on individual spoons, this mac with aged cheddar and truffle bread crumbs hits the spot. A pleasantly surprising ditty of a steak. The meat has a great seared crust on it, and for sixteen dollars, we aren’t complaining. This is really good, and could easily fill up one not-so-starving person. Three lobster sliders served on toasted brioche rolls. These bad boys were a great compliment to the Grass Kilt (coconut green tea-infused grouse scotch, lemon juice, pineapple juice, acacia honey syrup, cinnamon syrup) I was sipping when they rolled out of the kitchen. Now, this isn’t the purist Luke’s Lobster approach - this is more of a chicken salad type of lobster salad as the lobster bits are mixed in equal parts with crunchy jicama, apple, and fennel slaw. They’re little mini lobster sandwiches, and they’re good. Sautéed mushrooms with caramelized onion pesto and walnuts on top of a pastry tart. Surprisingly tasty, and definitely a good drinking snack. 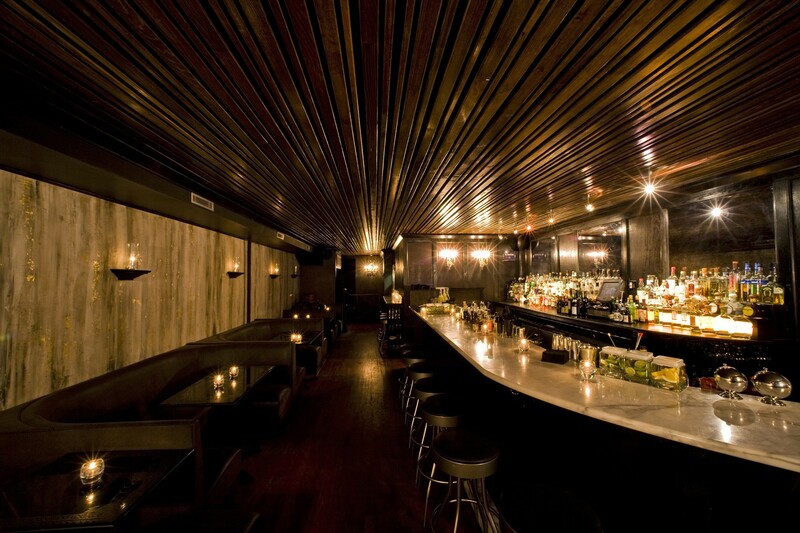 The Wayland is a fun, relaxed cocktail bar in the far East Village. The Garret is an attractive, low-key Alphabet City cocktail bar.